Wearable technology is weaving itself into the fashion industry and the latest exhibit at Pratt Institute Manhattan Gallery focuses on coding in design. 'Coded_Couture' displays customized garments and designs that utilise coding for their behaviour. Other mediums including videos, drawings, photographs and interactive applications are used to exemplify the direction that fashion is traveling. 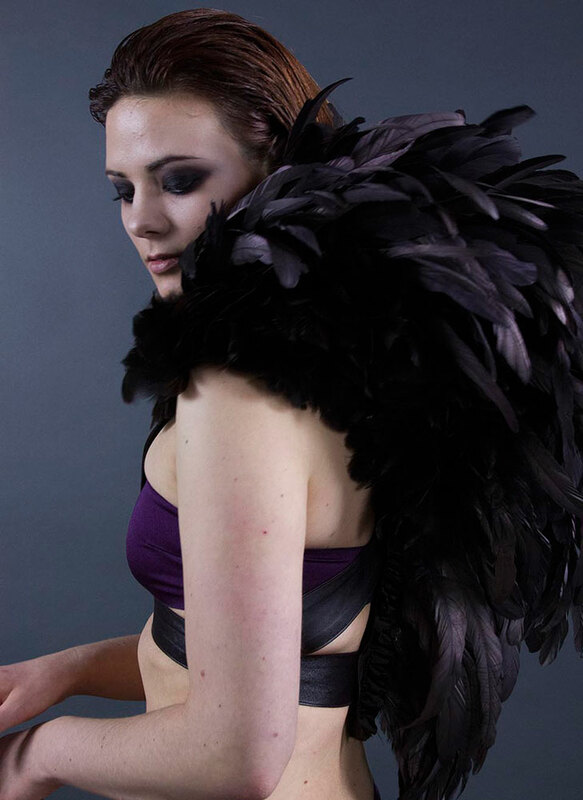 'Ruffling your feathers' attains a whole new meaning with BioWear kinetic accessories from leading wearable technology expert and industrial designer Rebeccah Pailes-Friedman. This particular design, pictured, is crafted using a stretch-leather harness with turkey and coq feathers that can communicate the wearer's emotions through movement. The kinetic accessory monitors the wearer's heart rate, so when the wearer is calm the individually arranged feathers will rest, and when they are excited or scared they will show movement. Dutch designers Melissa Coleman, Leonie Smelt and Joachim Rotteveel have created what is perhaps a controversial garment with the 'Holy Dress'. Designed with speech technology analysis, the dress will shock the wearer when they are being dishonest. Reminiscent of Pavlov's dogs, the shocks are designed to 'train' the wearer to be more truthful hence the 'punishment' of the shockwave. The shocks are expected to be no more than that of a dog's collar, typically no higher than 10.000V. A speech recognition system will monitor the wearer's conversation, always checking for lies through voice stress analysis. During conversation the dress lights up and grows in intensity as the wearer increases their likelihood of being dishonest. If a lie is told the lights will flicker and give the wearer an electric shock. Ying Gao's No[Where] / Now [Here] collection comprises some interesting concepts. The dresses use photo luminescent thread with embedded eye-tracking technology that responds to the spectator's gaze. This could prove to be quite interesting when worn, perhaps even making the wearer uncomfortable depending on where their company's gaze chooses to rest! The designer's Incertitudes range (2013) incorporates voice technology, dressmaker pins and electronic devices whereby the pins respond to voice in a series of wave-like movements. 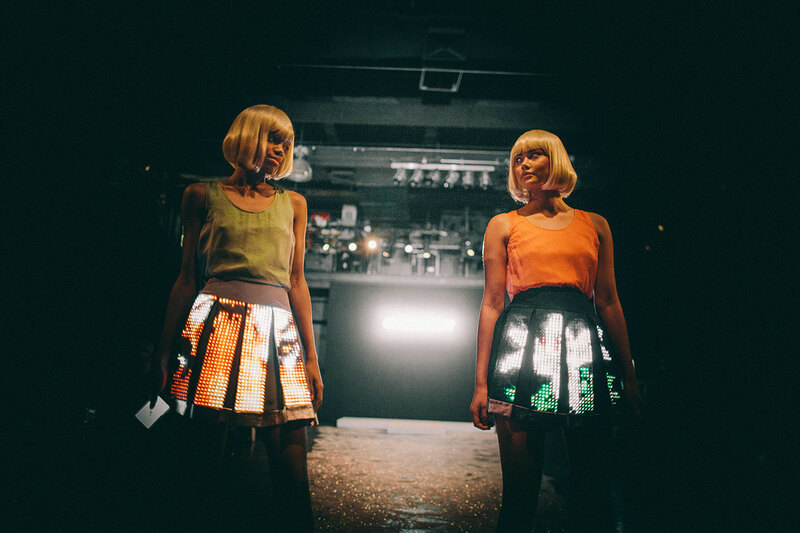 A cropped cousin of CuteCircuit's world's first haute couture Twitter dress, the iMiniSkirt lights up with a live feed of colours and animation from audience input to create a constantly evolving dynamic garment. At the Pratt Gallery Manhattan, visitors were encouraged to engage with the fashion piece using a specially-created hashtag on a nearby tablet. Exhibition begins at Pratt Manhattan Gallery before traveling nationally to galleries including Ulrich Museum of Art, Wichita State University, Wichita, Kansas; Tufts University Art Gallery, The Shirley and Alex Aidekman Arts Center, Tufts University, Medford, Massachusetts; CAM | Contemporary Art Museum, Raleigh, North Carolina; and Ruth Funk Center for Textile Arts, Florida Institute of Technology Melbourne, Florida.